Mississippi has become a Crappie lovers destination with many lakes that produce a bounty of big Crappie. Located in the heart of the State is the renown Big Crappie waters of Grenada Lake, Mississippi. Grenada Lake has become the home of Big Crappie and many Crappie Anglers have taken notice. Anglers travel from thousands of miles away in pursuit of a catch of a lifetime. Under normal Summer pool, Grenada Lake sits at a surface elevation of 215 feet and the total surface area of 35,000 acres. It’s used as one of four flood control lakes in North Mississippi constructed by the U.S. Army Corps of Engineers. This Spring it has served its purpose. In early February the Southern States including the Grenada Lake area received heavy rain for several days and continued rain into the month of March. As a result, Grenada is currently 220.60 feet, an amazing 5.60 feet above Summer pool. Not much when you think in terms of feet. When you factor in the total acres, Grenada Lake has grown to an estimated 46,000 acres, an extra 11,000 in surface acreage! With the additional water, this allows Crappie to spawn in shallow water located yards and in some spots, hundreds of yards away from boat accessible areas. Some of these areas can only be accessed by wading Anglers. While some of the spawning areas are to deep for wading Anglers and to heavily wooded for boats. 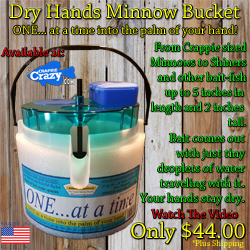 This can lead to poor catch rates by Anglers but the outcome will only provide a better than normal successful spawn for many Crappie and a bounty of Crappie in the next few years. We started our trip scanning deep river channels and ultimately finding fish and catching them, on the outer edges of Ironwood patches. We quickly noticed, the fish we were catching were female and full of eggs. No males. The high water was allowing males to go extremely shallow penetrating the heavily wooded areas of trees and vines. While females could be caught moving up to spawn, some located in the first ditch and others located suspended in the river channels, they were scattered. Time to park the boat and do some wading! 46,000 acres of water can be very intimidating. Where can I wade at? Where do I start? Look for shallow water areas that extend for hundreds of yards. While you can catch fish in spots that drop into deeper water, these areas are unsafe and your next step may be too deep! Once you find a area, walk slow, while shuffling your feet, one foot at a time. There are roots and vines under the surface that can not be seen. The slower you move the better. 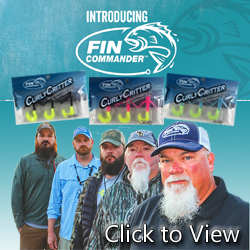 This will also allow you to be in stealth mode and sneak up on spawning Crappie. 1/8 ounce jigheads with #2 and 1/0 hooks will do the trick. The 1/8 ounce weight allows the jighead to penetrate the dense cover better. Our choice was the Crappie Pro Mo’Glo Orange or Pink Jighead. Our plastic of choice was the Muddy Water Hat Trick, Orange & Glow, Gold & Glow, or Black & Pink. Another plastic we found much success with was the Bobby Garland Stroll’R in the Grenada Gold, Gold Member and Horsefly colors. We used a 12 foot jigging pole and would drop our jighead 1 to 2 feet below the surface. Let the jighead sit for a few seconds and pop it with a quick tug of the line. The bite would be fast and forceful. Set the Hook! We also noticed most of our bites came close to larger trees with vines or clumps of vegetation attached. Try to fish every angle of the tree. Make a mental note when you catch a fish. How deep was it? Was it on the shaded or sunny side of the tree? Was it male or female? Paying attention to details and repeating them can make for a great day. Our prediction is in the years to come, 1-3 years, fishing will only improve on Grenada Lake. 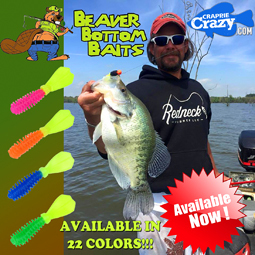 Crappie have more places to hide and spawn this year and in the next few years Anglers will see better catch rates, limits and even bigger Crappie!